Presumably by accident, Intel this week has published a list of its upcoming processors that belong to the soon-to-launch Skylake Xeon families. The names were published by Intel in a PCN, or Product Change Notification, which makes it likely that this was an accidental disclosure. In the PCN, it details that LGA3647 CPUs (which covers Xeon Phi processors and the upcoming Skylake Xeons) will have an arrow indicating which way processors should be oriented in the socket. It seems like an arbitrary PCN, just printing an arrow on a heat spreader, which makes this published list somewhat unexpected. But these names show the key parts of the Purley platforms for servers. One of the poorly kept secrets in the industry over the last few weeks is that Intel is changing the nomenclature of its Xeon CPUs going forward. This will be a difficult change to explain, given that users are so familiar with the previous naming system, and the translation between old and new is not a simple one-to-one mapping. Skylake-SP thus introduces the new Xeon Gold and Xeon Platinum lineups for different markets of servers. We expect all these CPUs to be on LGA3647, given that the PCN seems to suggest that this singular print marking on the heatspreader was not on this socket design before. Unfortunately, the published list does not have full CPU information, but we do get names and frequencies of 34 Skylake-SP processors (see details below) that will belong to the Xeon Gold and Xeon Platinum lineups, as well as the fact that these processors are designated with the H0 stepping. We might not see all these processors at launch (which at this time has still not officially been announced), and we expect Intel to expand the Xeon Gold/Platinum family with new models over the several quarters following the launch. Based on the document, the initial Xeon Gold family will consist of 20 processors featuring 5000- and 6000-series model numbers. 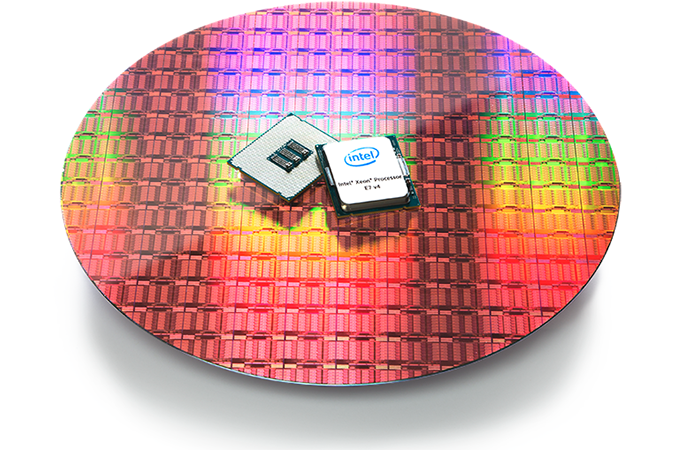 The Xeon Platinum lineup will feature 14 chips belonging to the 8000-series. Most importantly, the PCN confirms that Intel is about to scrap its Xeon E5/E7 naming nomenclature for something different with the introduction of the Skylake-SP/EP processors. Instead of E5 and E7, Intel will call its CPUs for 2P and 4P/MP servers Xeon Gold and Xeon Platinum. Moreover, the feature-sets of chips aimed at different kinds of servers will also be different, just like today. The upcoming Xeon Gold CPUs will work in 2P configurations and will thus replace the existing Xeon E5-series. Meanwhile, it is logical to assume then the replacement for the Xeon E7 will be called the Xeon Platinum, and apart from higher maximum core count will also support various additional capabilities, including RAS features. We suspect that there will be more names than Gold and Platinum coming to market to cover other aspects of Intel's product stack. In the processor stack above, we also get T and M processors in the mix. T processors have historically been lower power processors, and this is likely still the case given that the T processors have lower frequencies than most of the rest of the CPUs. Some CPUs, like the Xeon Gold 6130 and 6130T, are at 2.0 GHz for both: this is likely relating to different turbo frequencies, but also the T product is binned for lower power. The M processors are somewhat of a mystery, as we've never had M on a processor before, except in mobile. Speculating a bit on our part, this could be a reference to MCDRAM, which is a feature we see on Xeon Phi processors. Although to be clear, we have nothing to suggest that Intel will be including MCDRAM on these parts, as the Xeon CPU die itself may be big and the MCDRAM silicon is also relatively sizeable. We suspect that the M processors will have a given feature or features in common, which might come at an extra expense in the final price tag. In previous generations, Intel typically creates three different core designs for it's latest Xeons: a low core count (LCC), medium/high core count (MCC/HCC, depending on the document), and an extreme core count (XCC) version. The XCC version has the highest amount of cores, the most cache, and costs the most, but typically the per-core frequency is low. Intel sometimes offers the XCC in a small core count configuration, but with a large cache, and something like the Xeon Platinum 8156 at 3.6 GHz most likely fits that description. One of the things that should seem obvious is that the naming of each processor is not linear with clock frequency. For example, the Gold 6150 runs at 2.7 GHz base, but the Gold 6152 runs at 2.1 GHz base. Using that fourth digit extensively means that we hope Intel has a strong and obvious way to describe which part of the CPU names mean specific things. At this point it is hard to see a specific pattern, given we do not know core counts. Disclaimer: There's a significant amount of information in the ecosystem about the upcoming Skylake-SP platform, mostly from leaks that we can't personally confirm. So while we appreciate there is information out there, we've kept this analysis specifically to what is confirmed or could be inferred, as per AnandTech policy.